Things should be simple. But not any simpler! Steps to receive your bike from Railways. Are you planning to move to another town with your bike? or Are you in another town and planning to get your bike by Railway’s Luggage and Parcel service. This blog is meant for you! Today morning I got my bike- At LAST! I took a platform ticket and went to the luggage room. There a person took my receipt and searched for the bike. Not found. We both went to search my bike on the platform. After searching 2 platforms we finally found my bike at a place very near to where people commit nuisance. Hopefully it was packed nicely. The person who accompanied me stood by the side and said “Give me my share here itself”. “Chai” “Pani” are the most commonly used words. He asked for 50 bucks. I gave him 30 and said that even I could take my own bike from here. He agreed and we went to the luggage room from platform 5 to platform 1. At the luggage room, they made a gate pass for me and another person accompanied me from luggage room to the road. I had to pay him another 30 bucks for just taking my bike out. I was shocked. When the bike was ported the tank was empty. How on earth can petrol go inside?! I left the gate pass with the gatekeeper and he took me to a higher official. On the way he said “There’s a lot of petrol in the bike”. I said “I never filled it”. Higher officer came in and said “Open the tank”. I did. He shook and said “There is a lot of petrol. More than 1 litre”. I said “But I never put the petrol in it. I can even show the receipt where it says the tank was empty when it was loaded on the train”. He said : “So you think the railway will put petrol in it?” “Look sir, I have to fine you. I don’t leave people out of this checkpoint. ” ” Go to the court and pay 1000 bucks”. And he went to bring the fine receipt book. I gave him 200 bucks and then he went to talk to “Higher Officer”. Suddenly he came back. For a second I felt that the officer didn’t agree. He came to me and said “Boss, Give me 50 bucks more”. I gave it immediately. He went and gave it to the Officer and took my bike outside. After going outside he said “Come quickly, come quickly! See I saved so much money of yours. Now give me mine and I will leave. Give me 100. I said “100 is too high. I will give 50.” and I took out 50 rs note and handed him. He hesitated to such an extent that I had to take out another 20. Rule says: When your bike comes, it shouldn’t contain a drop of petrol. Fine for defaulters is 1000 bucks. Railway ensures this by: During time time of acceptance, the officials check for the petrol tank is empty or not. The receipt handed over has it documented as “Petrol Tank EMPTY”. When the bike is in railway’s custody. They somehow back force petrol inside the tank. The can even do that in the train(who knows!). There is high amount of understanding between the railway and transport department regarding this. The transport authority or rather say “Higher Officer” never checked for any of my bike’s documents. Neither the registration, nor the NOC. How did the petrol go in there while at the time of booking one empties it and the OFFICERS assures it by documenting it as “Petrol Tank EMPTY”. However I am amazed at: I had my bike’s keys, Still how did they manage to put the petrol in the tank? May be some day I would get to know this …. I am still in search for enlightenment…. While you’re in search for the bike. Instead of paying the man just 30 or 50, give him straight 200 bucks and tell him to take out all the petrol anyhow. This way you will save 200 bucks. This entry was posted in me on December 23, 2006 by Hussain Fakhruddin. Pune Barcamp2 was simply fantastic! Organised in Symbiosis Institute of Computer Studies and Research last Saturday(16th Dec) was heard to be one of the most well managed Barcamp of its kind. I wasn’t prepared at all! Went to a quieter place and started to prepare! After two hours I managed to modify some of my earlier animation and bring up something like a presentation!! Haha!! Meanwhile I attended Freeman’s session. He was talking on “How to start a start up”. Nice talk. Wanted to know more of it but immediately was lunch break. But somehow the lunch got delayed and I very quickly managed another session on Mobile Application. It was a nice session based on PDAs. The speaker was from TCS whose name I forgot. Lunch followed. Nice fried rice and sweeties…. I had a session at 5pm but It somehow got preporned as Brajeshwar’s demo on Photoshop CS3 got postponed or I DUNNO! I talked the stuff which I had developed some time ago. One small flash weather widget which would fetch data from weather.com and also an online showroom which website which I did for West Mill USA shoe store. I also showed some code in Actionscript and PHP. My session was followed by Abdul Qabiz‘s talk on Apollo, the product coming up in 2007 by adobe. Networking dinner followed at SIMS and this time I was a volunteer! some good amount of networking happened. Excellent food! Thanks to the “So Called Organisers”, The volunteers(including me) and all the speakers and everyone! I wonder Kolkata never had any such events?!! I am very serious in Organizing it in Kolkata! 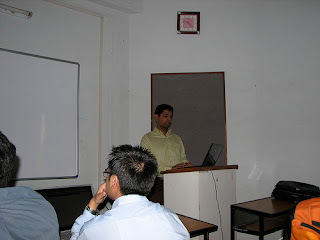 This entry was posted in barcamp on December 20, 2006 by Hussain Fakhruddin. Technically this aint my first blog. I had started many blogs but failed to keep them alive due to several reasons. But then someone would ask me why this now? I would answer: Just Like That! But this time as the new year is coming up, I am planning to keep it alive! This entry was posted in All Blog Category on December 20, 2006 by Hussain Fakhruddin. Innovate Or Die: The Cost Of Doing NOTHING ! tailang on Steps to receive your bike from Railways. Raghu on Steps to receive your bike from Railways.